How Froyd looks in 3D view. Cool Froyd is taken from an artwork I painted back in 2009 for my first solo art exhibition. You can see me paint the original artwork in my vlog series, E13: TETs S.A.L.A. Exhibition Journal. 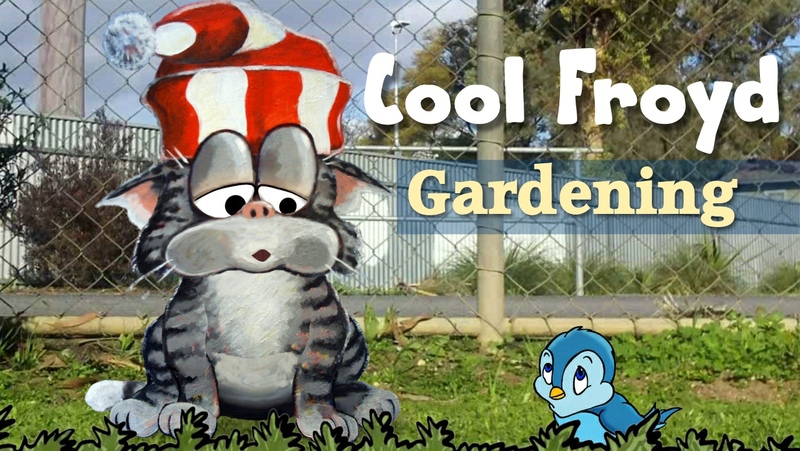 When I first discovered CrazyTalk Animator Pro, Cool Froyd is the first of my own characters I created with it. 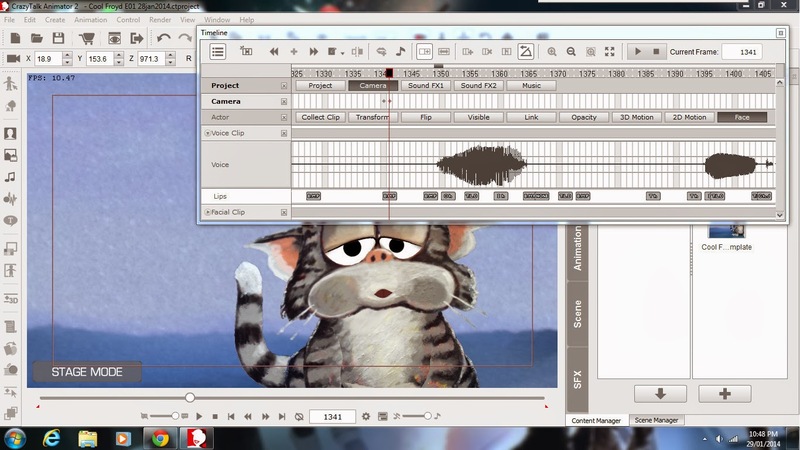 There's a detailed look at how he was made in this post, Cool Froyd the Cat and Crazy Talk Animator Pro. You can also read about how he is animated in CrazyTalk Animator 2 in this post, Cool Froyd the Cat and Crazy Talk Animator 2 (Pipeline). The script for this video is actually based on a real cat (who is actually grey but lacks the black stripes and beanie) owned by our neighbors. 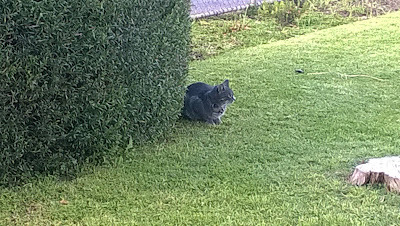 This cat visits our front yard on a daily basis and hangs around the hedge bush you can see to the right of Froyd, in the video, chasing the birds that come into our yard. next to the same hedge as Froyd. I thought, what if chasing birds is a cat's idea of 'gardening'? 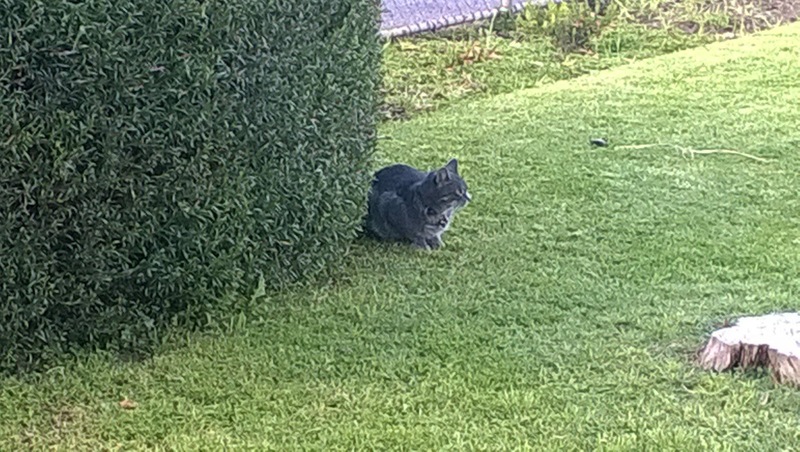 Eradicating a garden pest - well at least from a cat's point of view. Later in the video Froyd tells the story of me planting a row of hedges, which is something I actually did, recently, along the fence behind Froyd. From having cats as pets in the past, my experience is that, whenever you dig anywhere in the garden, there's a high chance your pet cat will come along and take a quick bathroom break right where you're digging... because that's the only reason anyone digs a hole, right? If you haven't seen the previous two episodes, then Froyd's coffee reference at the end is homage to those. I think his obsession with coffee is probably going to be a running theme of future episodes. After writing the script the first thing I did was shoot some video footage of the location in my front yard. Froyd's previous video used the real world background of my kitchen so I wanted to continue that theme. Unfortunately, even though the camera was tripod mounted, I accidentally introduced a little bit of camera shake to the video, playing around with the controls. It's not too bad but I'll remember to just leave the camera alone next time. All the bird noises and ambient sounds in the video are exactly what was recorded along side the video footage - you can really hear we have a lot of birds in and around our garden. After that I needed some birds to interact with Froyd. I wanted to get this video done as quickly as possible so, rather than animate something myself, I immediately thought of Garry Pye's Blue Bird prop. 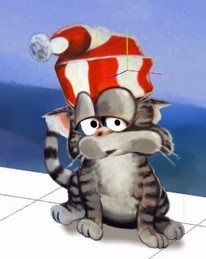 If you use CrazyTalk Animator and you don't know Garry's work (where have you been?) then check out his website and buy some of his amazing CTA characters and props. In past episodes I voiced Cool Froyd myself by adjusting the pitch of my voice slightly higher using Audacity. Although I think I did a reasonable job, I kind of felt the pitch adjustment made Froyd sound a little unnatural. TimberWolf is an animator I knew from the old GoAnimate, before it went all business. I had been watching some of his Youtube videos, where he voices some of his own characters. I thought his voice could be a good fit for Froyd without any need to digitally alter his recording. I think TimberWolf has the right delivery. Froyd does sound more natural in comparison to previous episodes. Animating Froyd in Episode 01. Froyd is a single angle puppet rig with a semi 3D CTA2 style head. He has full body articulation but, because he is based upon a painting, there's very little body movement he can perform that doesn't look like he just broke a limb. Hence body movements are reduced to very subtle changes to give the sense he's at least breathing. The head, on the other hand, can be freely puppeted, using the mouse in real time. Since the lip sync is automatic the first pass is simply recording appropriate, puppeted head movements as Froyd speaks. From there I usually go through several passes of the timeline, key framing various body parts, such as his ears, eyes, beanie and even his whole head movement, until he looks as life like as my skills and patience can make him. With each episode I think I'm getting better at animating him but I will concede he still doesn't move quite as naturally as I'd like. You can actually modify the lip syncing to make it more accurate than the auto lip sync achieves but I struggle with this on Froyd because his mouth movement isn't particularly natural at certain points. I think I need to work more on how his mouth is rigged so it articulates better. Maybe next episode. Demonstration of the key framing on the bird in CTA2. Garry Pye's Blue Bird prop was a real surprise and eye opener to animate. In the original script I wanted the birds to fly away but Garry's bird has no animation for flying. It's basically two sprites, a head and a body. It does have multiple heads so you can close the eyes or make the bird look in different directions but that's it. I've watched how smaller birds tend to move with a jumping motion rather than walking. Which is lucky because Garry's bird can't move it's legs, however key framing the body in a jumping motion (and hiding the legs behind Garry's grass prop) really sells the bird's movement. Making sure the head moved correctly in relation to what the body was doing also adds to making it work. If you view the bird's movement frame by frame you'll see the head compress into the body at the start of a jump, with the eyes closed, then stretch out to the jump peak. The eyes then open and look toward where the bird is going to land. Other things you'll notice is when the bird turns from side to side it first closes its eyes, then the head flips, followed by the body flipping on the next frame, then the eyes open again. All this gives the illusion of more sprites to animate the bird than there actually is. Bird sequence: Notice the head always flips before the body when he turns. Over all, I think the animation of the bird is the highlight of this episode (from a technical aspect). I never imagined it would take me two days to animate it entirely with key frames (being a prop it's not possible to use any of CTA's pre-animated motions on it). Previously all the titles for Cool Froyd episodes were done in CTA2 as part of the animation but this time I exported all the animation and brought it into Serif MoviePlus X6, my video editor of choice. My main reason for doing this was actually to balance the ambient noise from my background footage so it wouldn't over power TimberWolf's voice acting. CTA2 doesn't let you adjust the level of audio on an imported video file. It just plays at whatever volume it was recorded at. The end credit titles themselves are just template title scenes from the MoviePlus library. I was able to overlay Cool Froyd and the bird sequence over the title simply by exporting a version of this sequence with a green screen background instead of the video background. I had the green screen version of the animation because I was going to try adding the video background in MoviePlus instead as part of the source animation. I thought I might be able to do some additional effects, such as blurring the background on close ups of Froyd, but scrapped the idea as being too fiddly and time consuming. Since I had the green screen version I thought I'd make use of it here. Overall, this episode took me two extra weeks more than I expected. I seem to have a talent for underestimating how long my own projects will take! I am, mostly happy with how it turned out but I still think I could animate Cool Froyd better than I have. I do love watching the animation on the birds. I think I really got those right with how quickly they move. I'm certainly getting more confident with animating in CrazyTalk Animator 2. Hopefully that'll make the transfer to CrazyTalk Animator 3, which is expected to launch October/November, easier. Although I find Froyd quite difficult to write for, I do plan to produce more episodes, sooner rather than later. If you like Froyd and want to see more of him, let me know in the comments below. Feel free to suggest things too. Who knows, I may just be inspired with your ideas. I just love that you do these posts to the making the animation. And you know I love love love that little birdie of Garry's. He is just darlin' and the animation is so very life like ... the do jump around on the ground I watch them all the time. I want him. As for Cool Froyd, well I almost donned my tee-shirt of him to watch this. Cool Froyd is just too cool. Personally, I wouldn't worry too much about the mouth movement--you are so concentrated and listening and watching his eyes and eye lids moves, that you don't hardly notice a mis alignment to speech with his mouth. At least I didn't and I watched it a few times. Once actually just watching the mouth, and honestly do that was hard because his head and eye movements were just so attractive. Fun script! and yes, Timberwolf did a nice job with the voice over. I'll try to think of some ideas for a script as I move through my own routines. All I can say about the learning curve on CTA is buy it now and just play with it when you can. I'm pretty time poor. It's only taken me 4 years to learn how to do most things in CTA2 but I still struggle with it at times. Cool Froyd's mouth really bugs me because it doesn't look natural in some positions. I'm going to fix it eventually. If you do think of ideas for scripts note that I tend to favor ideas that are more playing on the natural behavior of cats rather than giving Froyd human traits (coffee fixation excepted). Glad you enjoyed this new episode. Hoping to get another done real soon. Nice one Bro, keep it up.